Israeli theater persona Nissan Native was found dead in his Tel Aviv apartment Sunday night. Native was named winner of the 2008 Israel Prize earlier this year. He was 86 years old. 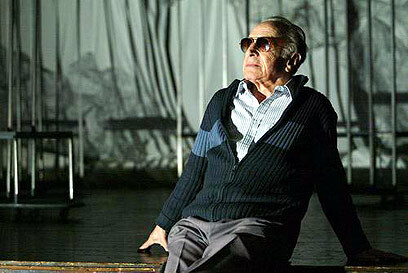 Native was the founder of a renowned acting school, which held classes both in Tel Aviv and Jerusalem. Despite being widely considered the best acting school in Israel and producing some of the most acclaimed actors in Israel – such as Moshe Ivgi, Keren Mor and Tiki Dayan, to name a few – the school battled financial difficulties in the past few years and was on the verge of closing down. The Israel Prize committee cited in its decision that Nativ's contribution to Israel culture and theater was invaluable, and that he was responsible for cultivating generations of actors and directors. "You cannot imagine Israeli theater without Nissan Nativ," said the committee. Native was born in Holland and came to Israel in 1937. He joined the Jewish Brigade during WWII, was an Armor Corps. Commander during the War of Independence and later studied at the Hebrew University in Jerusalem. He studied mime in Paris and upon his return to Israel began working as a director in various theaters and in Israel Radio. He formed the Nissan Nativ School of Acting in 1963. Native was the winner of the 1992 Tel Aviv Award for the Performing Arts and the 1999 Israeli Film Academy Lifetime Achievement Award. See all talkbacks "Nissan Nativ dead at 86 "